Send your mouth on vacation from Atlanta with this simple family friendly Spanish recipe from our family at Laurel Pointe Apartments. 2. Line a baking tray with non-stick baking paper. 3. 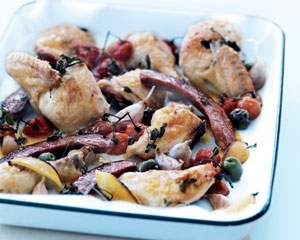 Add the chicken, chorizo, olives, tomatoes, oregano, lemon, garlic, oil, salt and pepper and toss to combine. Cook for 30–35 minutes or until chicken is cooked through and the chorizo is crisp. 4. Discard the lemon wedges before serving. Posted on January 23, 2013, in Laurel Pointe, Recipes, Something to Write Home About. Bookmark the permalink. Comments Off on Simple Spicy Chicken w/ Chorizo.